Feeding: The Native American Indian Dog may require a no soy diet. They must be fed a large breed dog food to prevent injury to joints. Like other large breeds, the Native American Indian Dog must not be over exercised during the growing period to prevent injury to joints. Family Dog: The Native American Indian Dog is excellent around children of all ages but must be raised around them. They get along well with exotics and other animals except for goats. They can be shy or aloof with strangers but are very protective of their family and bonds very strongly with their owner. Shedding: The coat of the Native American Indian Dog sheds only once a year during the spring. This breed has no doggy smell and can be a good choice for people with allergies. Grooming: The coat of the Native American Indian Dog needs to be brushed especially during the shedding season to cut down on shedding. Training: The Native American Indian Dog is a very sensitive and highly intelligent animal that uses extensive body language to communicate. They are eager to please and very responsive to visual and verbal commands. Due to their sensitivity, they need firm but not harsh training. Training classes and socialization at a young age is a must. Exercise: The Native American Indian Dog requires moderate exercise. They should have at least two short walks a day. They should have a fenced yard or other large safe area to run and play daily. The overall energy of this breed varies in every dog. Physical Ability: Jumping fences is a learned ability. A fence height requirement varies according to what your dog has been taught but a minimum of 6 feet is recommended for all breeds including the Native American Indian Dog. Living Conditions: The Native American Indian Dog is not good for apartment style of living. They do not do well being left in crates for long periods of time. Appearance: The Native American Indian Dog comes in two distinct sizes, coat lengths and color combinations. Size: The Native American Indian Dog is a medium to large dog with an average height for males of 21 to 34 inches at the shoulder with females being slightly shorter. The average weight is 50 to over 90 pounds depending on the type with females weighing slightly less. Head: The Native American Indian Dog has a medium to long, broad triangular shaped head extending down to a slender muzzle. Eyes: The eyes of the Native American Indian Dog are almond shaped and yellow, blue or amber. Bi-colored eyes are acceptable. Ears: The Native American Indian Dog has large, upright, prick ears. Tail: The tail of the Native American Indian Dog can be held down or in a "C" position. 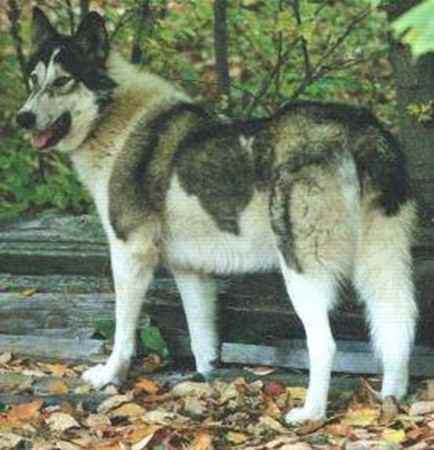 Color: The coat of the Native American Indian Dog can come in any color ranging from silver to black with the Broken Pattern being preferred and regarded as the "Spirit Dog". Coat: The coat of the Native American Indian Dog is medium to long in length. The shorter coat is denser with two thick layers consisting of a wind and waterproof undercoat. The longer coat has a long overcoat with a dense undercoat. Life Expectancy: The average life expectancy of the Native American Indian Dog is 13 to 19 years. Characteristics: The Native American Indian Dog was bred to be a companion dog but also excels at agility, sledding, hunting and Search & Rescue. They can be diggers. Health: The Native American Indian Dog is a Very hardy breed with little incidents of eye or crippling hip problems. History: In the times when Native Indian tribes traveled the plains they were accompanied by canines of unknown lineage, but were most likely wolves. To prevent close inbreeding new blood was introduced from other tribes which accounts for the different types of dogs described and portrayed in the historical books written about the Native American people, and the dogs that traveled with them. These dogs developed a close bond with humans possibly resulting from pack behaviors normal to wolf families leading to a trust that allowed them to serve as guards, and baby-sitters. Their natural herding talents made them assets, for hunting or keeping livestock close to home, and were used for pulling cargo litters or travois when the tribes were on the move. These dogs played a role in tribal mysticism and sacred ceremonies. In lean times they were even used to sustain the tribe as food and their fur was used for weaving. Several types of "Native Dogs" developed, delineated by the geographic regions where the Native Americans lived. The Northern Tribes developed a wolf like dog, and includes the Hare and Sioux type of Indian Dog. Through the Western Regions the smaller Plains Village Dog was developed. When the white man invaded the plains, both the Native American people and their dogs were all but exterminated. It is difficult to prove that there are any authentic Native Dogs being bred today, however, it is possible to re-create the TYPE of dog with the same qualities that were used by Native Americans. There are many books with descriptions and photographs of the village dogs which were used to develop the NAID. Buffalo Bird Woman of the Hidatsa Indian Tribe has contributed to the documentation of the village dog, and outlines the breeding and management of their village dogs. This information is documented in the book listed below. The Horse and Dog in Hidatsa Culture. Anthropological Papers of the American Museum of Natural History, Vol. XV, Part II. Wilson, Gilbert L 1924. The foundation stock of the NAID is Siberian Husky, Malamute, Chinook and a small percentage of German Shepherd. The NAID is an actual breed, although not recognized by the AKC. These dogs are bred for a family lifestyle. They can be trained to pull a sled, pack game, and be used for agility. NAID's develop a strong bond with their keepers, but they are not a good guard dog due to the fact that NAID's rarely bark and are a non aggressive breed. This breed has no doggy odor and is a clean breed. The NAID is ideal for those who suffer from pet allergies; they tend to produce less dander than most breeds. Most allergic people have NO reaction to this breed.